Nobody wants to mess with the toilet bowl…at least when it comes to cleaning. 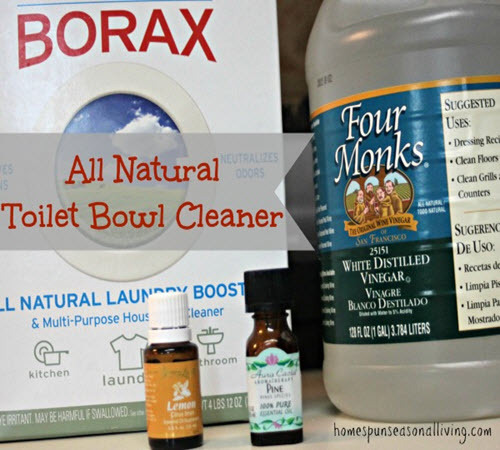 Many people who use natural cleaning products feel those products just can’t cut it when it comes to dirty toilet bowls. And, you may have your go-to, store-bought products, but take a peek at what this simple concoction can do. Natural doesn’t necessarily mean weak. And, this simple blend of household items is all natural. Remember, your toilet bowl doesn’t have to be blue to be clean. Nor do you need to use store bought, super powerful chemicals to get it clean. Use these all natural products to make your bowl sparkle and shine just as much as any store bought product.